CLEMSON, SC – Senior Sthefany Thomas hit five 3-pointers and scored 17 points, but it wasn’t enough as Georgia Tech (14-4, 2-0 ACC) outlasted Clemson, 64-53, in Littlejohn Coliseum on Sunday. Freshman Kelia Shelton also added a career-best 13 points, five rebounds, and four assists off the bench for the Tigers, who drop to 8-9 overall and 1-1 in conference play. Clemson went into halftime trailing by just six points at 32-26, but Georgia Tech put on the clamps defensively in the second half. The Jackets held Clemson to just two field goals over the first 9:55 of the second half in opening up a 52-32 lead with just over ten minutes to play. They stretched the lead to 23 points at 60-37, but Clemson held the Jackets to just four points over the final seven minutes in closing the deficit to nine with just over a minute to play. The key was Georgia Tech holding co-leading scorer Kirstyn Wright without a point in the game, and 0-6 from the field. Wright entered averaging 12.9 points per game, and had hit 10 of her last 14 three-point attempts. Overall, Clemson shot the ball well, hitting 42.0 percent of the field goal attempts and 8-17 (.471) from behind the arc. Tech was able to limit second change and fast break opportunities for the Tigers, who turned it over 21 times, largely on 14 Tech steals. Four Yellow Jackets hit double-figures in scoring, led by Sasha Goodlett (15 pts, 8 reb) and Alex Montgomery (13 pts, 6 reb). Shelton was a big reason why Clemson was able to close the gap late, as she scored 10 of her 13 points in the second half on a personal 10-0 run, while also grabbing five rebounds. Those ten came as part of a 12-0 Clemson run, which closed the scored from 21 down to nine. The opening frame was closely contested, as the Lady Tigers shot 54.0 percent (11-20 FG) in the half, and slowed Tech’s offense for most of the half. The Yellow Jackets used 11 points from Goodlett and 17 points off 15 Clemson turnovers to create the deficit. Thomas opened the game on fire, hitting her first four three-point attempts. 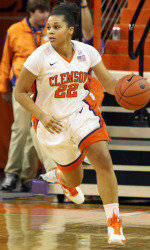 She needed just two to move alone into fifth on Clemson’s all-time three-point list, passing Julie Aderhold. She hit her second with 8:51 remaining in the half, and four of her threes came in the final 9:41 of the first half. Shelton hit Thomas on three of her long-distance hits, and finished with a career-high four assists in 28 minutes, playing primarily at the point. Clemson will return to action on Jan. 14 as they travel to Miami for an 8:30 pm contest, which will be televised live by the Regional Sports Network.